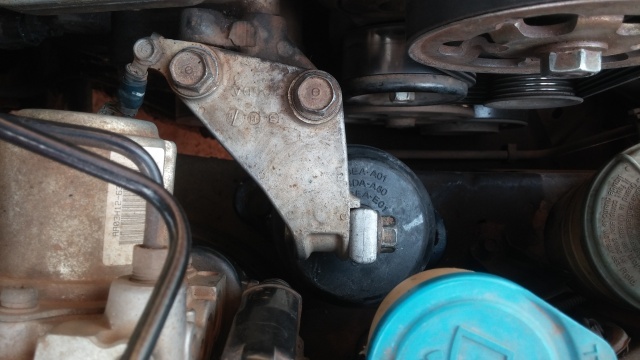 This is the procedure for the change of the right (aka passenger side) engine mount on the 2003 – 2007 Accord with an automatic transmission (AT). It also applies to the 2004 – 2008 Acura TL and TSX with an AT. 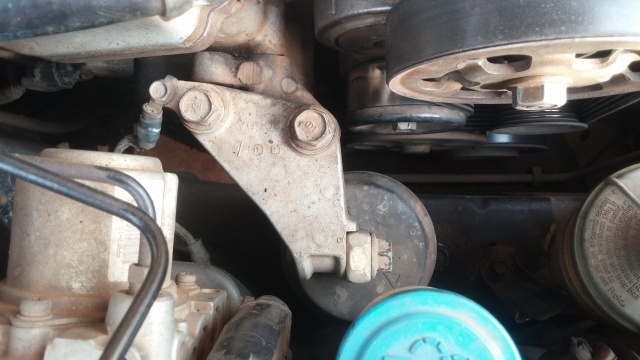 Do you know that that rattle/clunks you have when going over uneven roads at low speed could be due to a worn right engine mount? This was exactly my case and the rattle sounded as though it was coming from the right front wheel suspension! In a subsequent post, I would detail a procedure for locating suspension noises. Watch out for that. 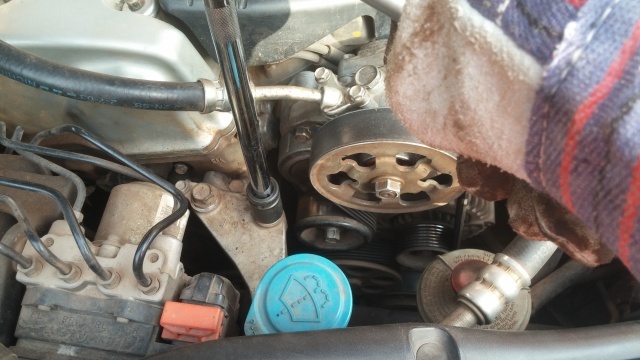 The Right engine mount is located by the serpentine belt area posterior to the power steering reservoir. This procedure and part is the same for both 4cyl and V6 engines. 1. Jack up the car and secure on support stands: remember never work under a vehicle supported only by a jack. 2. 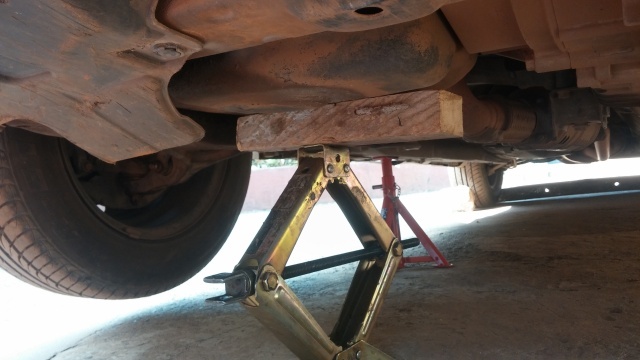 Place a block of wood between the oil pan and jack up: The jack is just meant to take the weight of the engine, so once the engine starts moving up you can stop raising it. Ensure you use a block of wood else you would most likely dent the oil pan and set off the low oil pressure warning light! 3. Unhook the power steering reservoir and move aside: This would create the space needed to remove the engine mount bolt. 4. Remove the 17mm bolt attaching the right engine mount to the mounting bracket. 5. Remove the two 17mm bolts attaching the mounting bracket for the right engine mount to the engine block.These 2 bolts needed some serious torque to break loose! This was why I recommended a breaker bar. If you do not have a breaker bar, you can use an 17mm L-type spanner with an extension bar in the other end to increase leverage. This worked for me. 6. Set the mounting bracket aside: This would still be attached by the ground cable so just hang it on its seating area on the engine block. 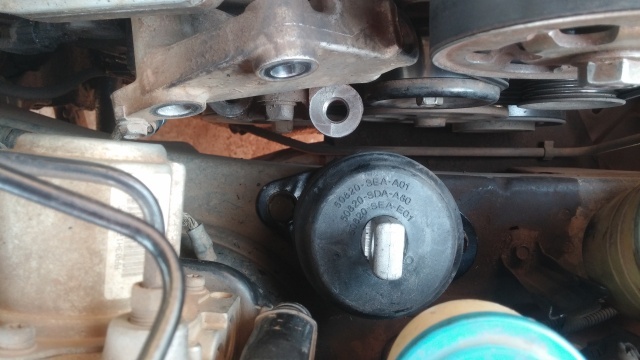 The right engine mount is covered by a rubber cap which hides any wear to the part during a visual inspection. I slid this off to find a well worn mount! 7. 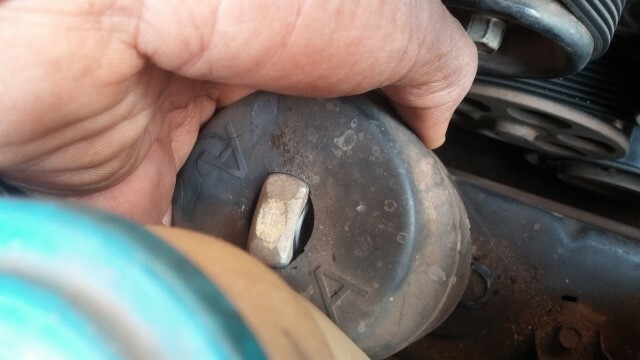 Remove the two bolts that secure the engine mount to the subframe: These are two 17mm bolts on either side of the right engine mount. 8. 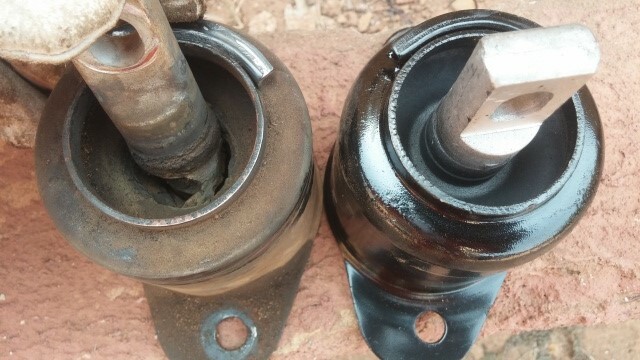 Remove the right engine mount: Once the 2 bolts above are removed, the part is free to come out. Mine was badly worn, perfectly concealed by the rubber cap for the mount >:( The centre piece was completely severed from the mount. Tip: If any of the mounting bolt threads are rusty use a wire brush to remove the corrosion. 9. 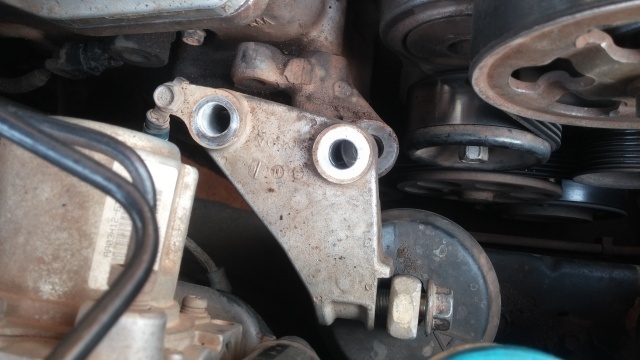 Install the new Right Engine mount: Note the orientation of the old mount and insert the new in its place. 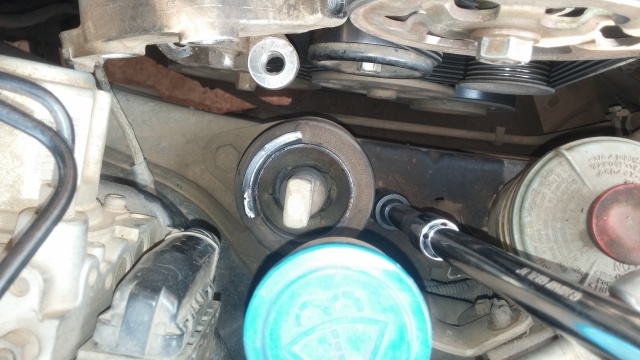 This can easily be done as the old mount will leave an outline on the subframe. Torque the 2 bolts that attach the mount to the subframe to 44Nm. New Right engine mount secured on subframe. First secure the two 17mm bolts that attach the mounting bracket to the engine block (the bolts removed in step 5). Torque these 2 bolts to 54Nm. Next, screw on the single 17mm bolt that mates the R. engine mount to the mounting bracket (aka upper bracket). This is the bolt removed in step 4. 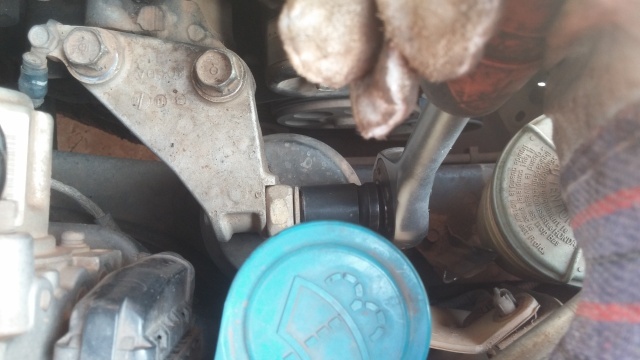 If it is difficult aligning the hole on the engine mount to that on the mounting bracket, vary the height of the jack placed under the oil pan. In my case I needed to reduce the height slightly. Torque the bolt to 64Nm. All done! New mount installed. Hope you found this helpful. Many thanks for reading.